Peter Wood is one of Shetland's best accordion players and tutors, with a career spanning decades. Whilst his band was formed just four years ago, in that time they have released two successful CDs - with their debut winning the best new release of 2016, from the National Association of Accordion and Fiddle Clubs - and were nominated for Dance Band of the Year at the MG Alba Scots Trad Music Awards 2016. 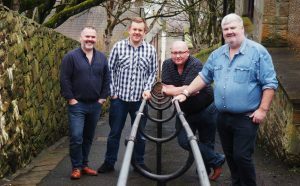 With Peter leading on accordion, alongside Andy Kain on fiddle, guitarist Arthur Nicolson, and Graham Jamieson on drums, the band play a mixture of traditional, continental, Scandinavian, swing and country music - set to be a sure fire hit with dancers.